Please join us in the sanctuary. Men's Group at Coram Deo Coffee Co.
Take God's Love to New Frontiers at GiddyUp Junction VBS. 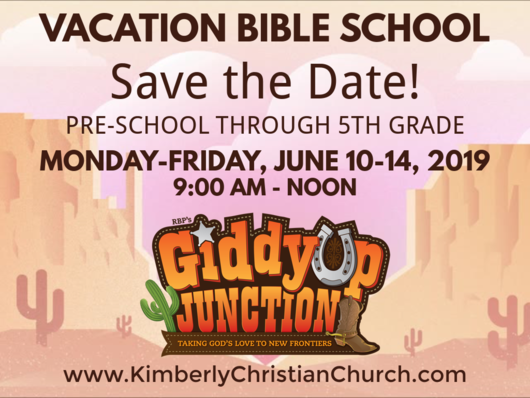 At this wild-western town, kids learn about the good news of God's love - the gospel - going to new frontiers in the book of Acts. Kids will spin lassos, mine for gold, and "ride horses", and they'll learn how to respond to God's love taking it to new frontiers today. Theme Verse: Greater love hath no man than this, that a man lay down his life for his friends (John 15:13).